Although it may seem straight-forward, the consumption of electricity by manufacturing machines may not always track with production activities. There are several reasons for a disconnect between the cost of the electricity that you use in your facilities' machines and the amount of manufacturing that occurs in your facility. One important reason is the frequent mismatch between a production machine's "design-specs" and the typical work-load in your environment. Another issue involves the time periods when your machines are not operating at their full production load -- idle periods, off-load times, gaps in production and shift changes. These issues are really opportunities for substantial dollar savings on your electric bill. Next step: Setup power-use monitoring to identify inappropriately large amounts of electricity consumption (kW-hr) by a particular piece of equipment. 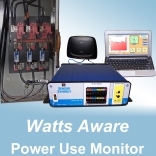 Compare power consumption measurement results from similar pieces of equipment. Power-use monitoring is necessary to understand the size of the problem. First determine the number of dollars used to supply one of your power-hungry machines with electricity during your company's typical "Return on Investment" (ROI) period. Monitor power-use for a few weeks - 24/7. Include weekends, and end of month production bumps to get a good average. Knowing the size of the problem, you can consider a range of electricity-use reduction projects. The cost of operating your machine and the expected savings from a project during the ROI period, help determine the size of the budget you may have to spend on improving your power-hungry machines. Knowing the size of the problem from power-use monitoring, you can consider a range of power saving solutions with cost-justified expenditures.